Alex Norris’ Dorris McComics is one of the strips on Doug Savage’s reading list. I’m please to present Alex here today. AN: I am Alex Norris. I am from the UK. I was born in Swansea in Wales, went to university in Bristol and now I am based in London. I studied English Literature at university, and I suppose that my literary side is definitely lurking in my comics but I think I hide it well. I think growing up in Swansea, a grim seaside city (in the words of Dylan Thomas, an “ugly, lovely town”) formed my love of celebrating crap things. BC: Do you consider yourself an artist, an illustrator, or something else? AN: I have tried all the names for what I do: when you say “comic writer” people think you write funny articles, if you say “I make comics” people assume you mean superheroes, and if you say “artist” people assume you put a dirty cup in the corner of a gallery and title it “Society’s Womb” or something like that. I’ve started saying “cartoonist” because people tend to understand that right away. BC: How did you get started, and what were your biggest breaks? AN: I drew my first comics when I was 10, I made a full issue of a comic like The Beano called “Bommynokka“, with all my own characters. One was “Dippy the Bus Kangaroo”, a kangaroo who did bus tours and the bus always crashed in various ways, and one was “The Friendly Bacteria” which was about two cool bacteria with backwards caps and sunglasses, based on an advert I saw for a probiotic yoghurt. I drew compulsively all the way through school, and then did comics for my university newspaper. 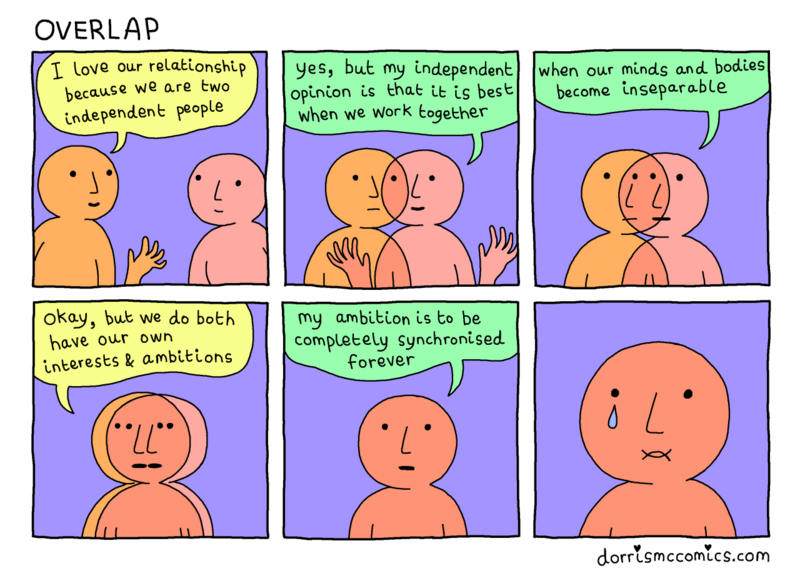 When I graduated I didn’t want to do anything else so I started updating Dorris McComics regularly and building an audience while working at a science centre. After two years, I quit my job and went full time! AN: My biggest breaks were probably getting a deal with Webtoon. I have done two series for them: “How to Love“, a love advice comic, and “Hello World” (ongoing) which is a photo-collage travel series. That meant I could do comics full time. Most other things have been more of a slow grind rather than a “break”! AN: Dorris McComics was just a place to dump all the ideas I had, playing with the format of comics and doing visual gags. It was a bit of a mish-mash. There was a joke that I put lots of effort into every comic and updated sporadically, so for April Fools one year I did 8 updates in one day, all very simple relatable humor ending with “oh no”. I was sitting on that idea for over a year before I decided I should make it a bigger project, so I started Webcomic Name. BC: Which of your works are you happiest with or proudest of? AN: I am very happy with Webcomic Name– I enjoy making a big solid series that has a strong concept all the way through! That has always been a struggle for me in the past. 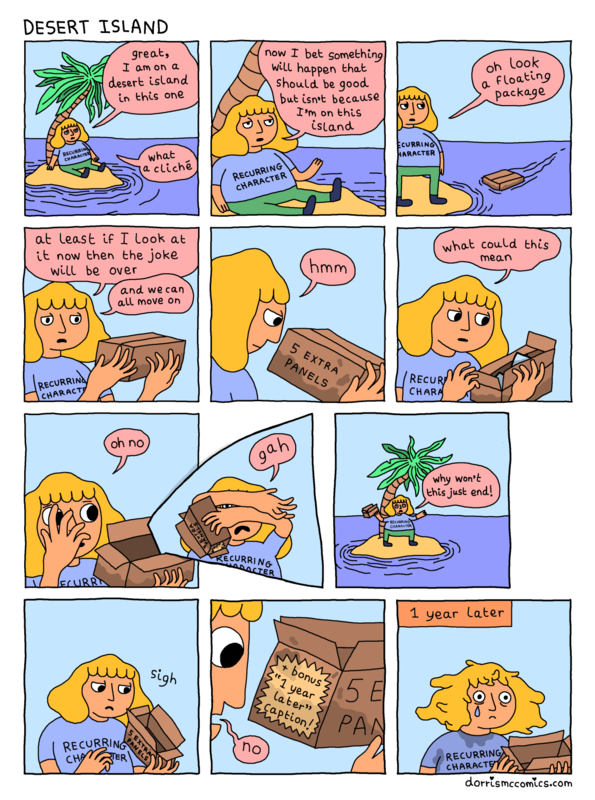 There are lots of individual Dorris McComics strips that I am also very proud of, because I worked on them one at a time, each one as a separate work, and some of my earlier ones are still very good I think. BC: What do you look for in a comic? Have you met any of the artists? Do you have any dirt on them? AN: There isn’t one thing I look for in webcomics- I tend to love so many for their own reasons. With both Dorris McComics and Webcomic Name I was trying to improve the webcomic landscape a bit, but I still love the things out there. 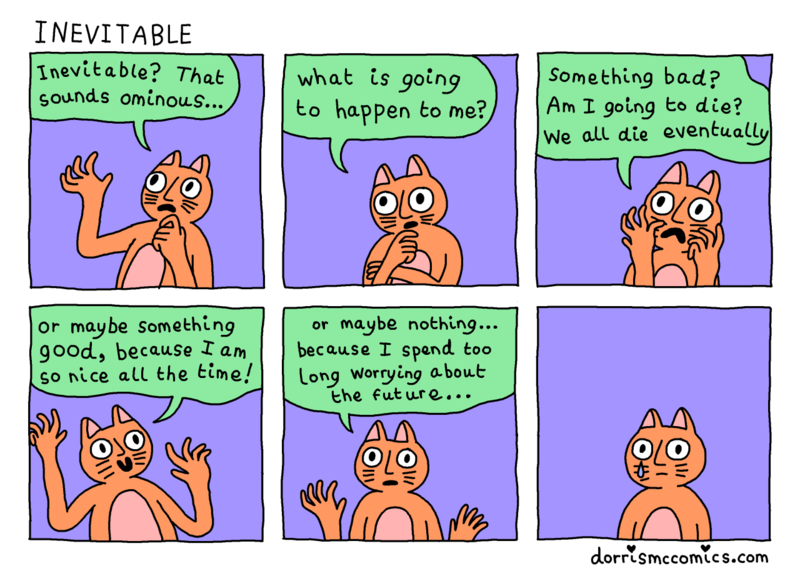 Just picking a few out of the hat, I love Julia Kaye‘s autobio strips, I love Olivia Walch’s wild threads of logic in Imogen Quest (most underrated webcomic imo), and currently enjoying Poorly Drawn Lines, you never know where the punchline will land! There are so many more I love, and I have met a lot of other artists at conventions. I do have dirt: they are all disgustingly lovely people. BC: Who are your favorite artists/writers? AN: I don’t consider myself just a webcomic artist although that is what I do now- I want to make plays, television, movies, animation, sculpture, painting, poetry, novels, anything I can! But webcomics are one of the most accessible and small and inexpensive things you can make, so they suit me now. So I get inspiration from lots of places: At the moment I love the silly, cartoonish (yet literary) poetry of William Blake and Emily Dickinson and Ogden Nash, and also silly, cartoonish (yet dark) books by Kurt Vonnegut and Roald Dahl and Oscar Wilde. And this week I am into movies that have a very strong emotional core that let you get away with a wild storyline, like Mrs Doubtfire and Ghost. BC: Have you used Kickstarter or Patreon? BC: Do you have any upcoming appearances or conventions? AN: I will be at Planet Comic Con in Kansas City (Apr. 28-30), and MCM London (May 26-28).